So…the UK football season didn’t start out the way we all wanted. It seems to be a familiar beginning to a familiar story. Even when the season starts off with a couple of wins, we often seem to be right back where we started – disappointed and hoping next season will get better. Like a lot of the Big Blue Nation, I often search for anything to be excited about or to be positive about when it comes to our UK football team. One thing is for sure, Kentucky continues to play a lot of young players. These young players are super talented, and it does give us all hope that next year will be better. I think it’s especially exciting for UK football fans that live in UK’s backyard to see a lot of familiar faces in Kentucky’s future. Lafayette High School product Landon Young has started at left tackle for the Cats as a true freshman. Anyone will tell you that you rarely see a freshman start on the offensive line in the SEC. In the context of full disclosure, I’ve always been a major supporter of Landon because I coached him on a baseball All-Star team when he was 8 years old. Of course, he was the only player to look me in the eye at 8 years old, but we all knew then that he was a special athlete. Landon has always been extremely coachable, even at a young age, so it’s been a pleasure watching him grow as an athlete and as a young man. Stoops added that as coaches, you look for guys who not only improve from the time they get on campus, but you really look for the guys who make “really big jumps” in improvement, and he said Kash is one of those guys. 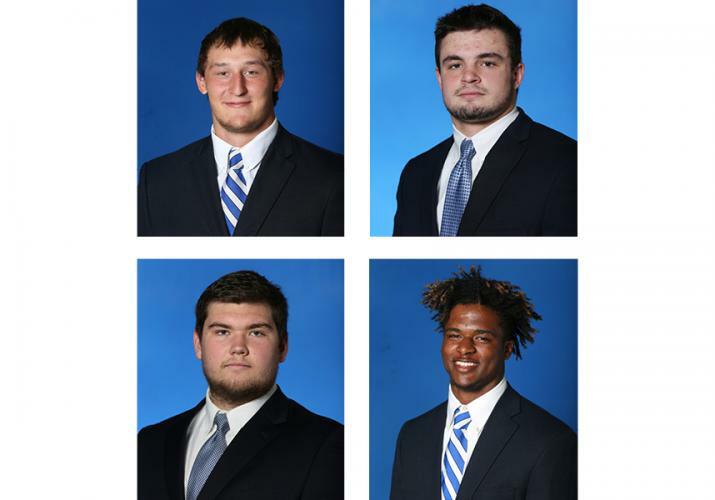 Then on the sidelines redshirting this year for the Cats are two more local football stars. Drake Jackson was one of the top centers in the country coming out of Woodford County High School, and Davonte Robinson is a top cornerback prospect out of Henry Clay High School. Which got me to thinking about some of the other great football talent that came out of the area last year and are playing Division One this season. Murray State; Devon Key, who is playing at Western Kentucky; and Mikel Horton, who is playing at Wofford. Joining Horton at Wofford this season as a true freshman is Lafayette product Mason Alstatt. It’s worth noting that Horton and Alstatt have both scored touchdowns for Wofford this year, even though both are defensive players. Dunbar product Nick Martin is playing for Charlotte this season. If we look ahead to next season, there are at least two more local stars who will be playing major Division One college football next year, and they both currently play at Lafayette. Big Jedrick Wills is one of the top offensive lineman in the country, and Walker Wood has already committed to play at Kentucky. So when did the Lexington area start producing all of this top-tier football talent? Specifically, when did this area start producing major Division One offensive linemen, such as Young, Jackson and Wills? I think you can argue that while UK is still going through some “growing pains”, the Lexington area has become a true ‘football town’. Even though Lexington has produced Winston Guy (Lexington Catholic), who currently plays in the NFL with the Indianapolis Colts, and Darian Miller (Bryan Station), who recently played for the Cleveland Browns, the area hasn’t produced a lot of NFL talent in the last 20 years. Shane Boyd and Chase Minnifield (Henry Clay), and Eric Shelton (Bryan Station) all spent time in the NFL. However, we’ve got to go back to former Tates Creek kicker David Akers to find anyone from this area who had a successful NFL career in the last two decades. Akers kicked for 13 years in the NFL and was named to the Pro-Bowl six times. But I’ve got a sneaking suspicion that with the influx of all of this young talent, we’re going to see a lot more familiar faces in the NFL in the very near future. I think we’re very close to having another run like the area had when stars like Dermontti Dawson, Marc Logan and Frank Minnifield were all playing in our backyards.